The traditional homes on the island of Lombok have survived several earthquakes over the years. Concrete homes crumble. Often there is wisdom in the old ways. That’s what residents of an Indonesian island in the Ring of Fire learned after a series of earthquakes created havoc with modern concrete structures. Fathul Rakhman has a report at Mongabay. “Though elements like floor height or wall width may vary in different parts of the island, all traditional Sasak homes employ the same basic design: Thatched bamboo walls enclose dirt floors, connecting them to roofs of woven reeds. … Wooden homes can sway, or ‘breathe’ when earthquakes strike, concrete houses cannot; they have no flex and topple easily. “In North Lombok, the epicenter of the damage, 70 percent of the houses collapsed or were severely damaged. Rebuilding will require hundreds of millions of dollars, according to government estimates. “In Beleq, families in traditional houses ran outside like everyone else, fearing for their lives. Not a single one of their traditional structures fell, even as the concrete homes around them crumbled. “The Indonesian government has typically looked upon the traditional houses as ‘slum dwellings,’ an indicator of poverty. But Lalu says the government should support the construction of traditional houses. Not only are they cheaper, but as the recent disasters proved, they are infinitely safer. “For too long traditional homes have been seen to mark the persistence of poverty rather than the preservation of culture, ignoring their instrumental value, Lalu said. “As rebuilding plans take form, Sahir, the Beteq village head, believes the community should look to the past for inspiration. This open staircase is pretty cool. Unless you are wearing a skirt. A recent twitter series gave me a laugh. It sure shows how your perspective may change with a change of clothes. At the Los Angeles Times, Carolina A. Miranda wrote how she hit a nerve with one frustrated tweet. “A couple of weeks ago, after viewing an architectural schematic that featured a pair of elevated glass catwalks, I posted a tweet that invited male architects to navigate their own designs in a skirt. Idea: All male architects should be required to navigate their own buildings in a skirt. “In 2010, technology writer Joanne McNeil wrote about this very topic in a post that ran on her blog ‘Tomorrow Museum,’ later reprinted by Mediaite. More here. Let me know if you have encountered similar architectural challenges. Although I wear pants more often these days, I have memories of negotiating the green staircase above in a skirt — uncomfortably. “Eclectic Row, Briarwood, NY” (2017), from the exhibit All the Queens Houses. How much do you know about Queens, New York, a Big Apple borough located on Long Island? I think you’ll like this. A photographer, intrigued by the fiercely independent architectural self-expression of the borough’s denizens, recently showcased some of the quirkiest styles at the Architectural League of New York. “Over 270 of Herrin-Ferri’s photographs of 34 neighborhoods [were recently] installed at the Architectural League of New York in All the Queens Houses. … The ongoing photographic survey can be explored on his project website, also called All the Queens Houses. There viewers can explore by neighborhood, typologies (like detached houses and apartment buildings), and architectural details (including stoops and gardens). There’s a map of where he’s surveyed houses, with about a third of the borough covered in 5,000 photographs. See more photos at Hyperallergic, here. “Splayed Brick-and-Stone Rusticated Entry Porch, Maspeth, NY” (2015), from All the Queens Houses. 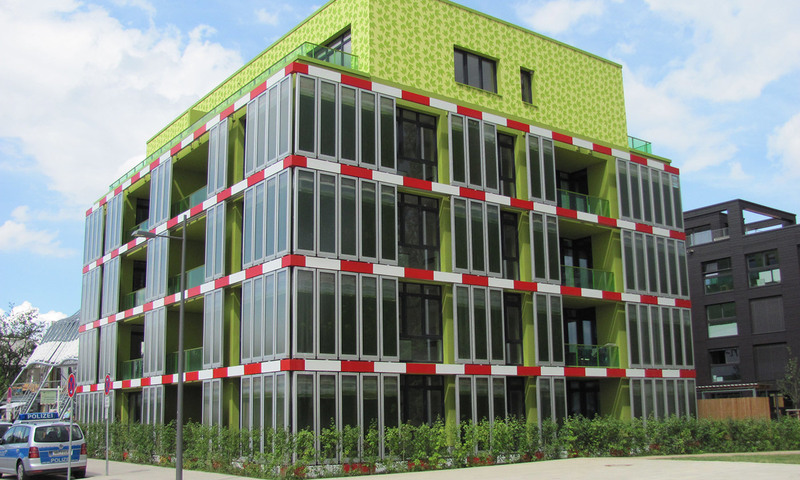 The facade of the BIQ (Bio Intelligent Quotient) house in Hamburg has tanks filled with microalgae that produce biomass used to generate electricity. It’s reassuring that there are always thinkers who are really “out there,” wildly inventing better ways to do things. For example, in architecture. Did you know there was such a thing as experimental architecture? Me neither. Rachel Armstrong is a professor of experimental architecture at Newcastle University in the United Kingdom. You can read about her views on breathable buildings at the website Aeon. “Traditional buildings are designed to provide protection against a savage world, with us safe on one side and our waste on the other. Architects have long relied on ‘hard’ materials such as masonry, aluminium and glass, specifically chosen to prevent the outside environment from getting in. Impermeability was, and is, a driving goal. “In many offices, it is no longer possible to open windows manually to let in a breeze. Automated air-conditioning systems (often answering only to sensors and software) blast summer heat out into scorching walkways, amplifying the urban heat-island effect and contributing to heat-related health risks. Such buildings ignore the metabolism that is the dynamic scaffolding of living systems. “The BIQ House in Hamburg has a façade of thin-walled tanks filled with microalgae. The algae harvest sunlight and carbon dioxide, and produce biomass that can be used to generate electricity. The translucent, living tanks also regulate the building temperature by absorbing more sunshine as the biomass increases. In this case, the glass of the tanks is impermeable to water but lets in sunlight – a different kind of permeability, which is critical for the organic exchanges within the façade. “The LIAR project is still in a prototype phase. Quantitative inputs and outputs have not yet been formally established. But project leaders expect to see integrated bioreactor wall systems in real homes within the next 10 years.” More at Aeon, here. A friend from my childhood called Caroline has been following this blog, sometimes making comments related to her field, which is architecture. Today Caroline sent me a link that she knew would be a perfect fit here. 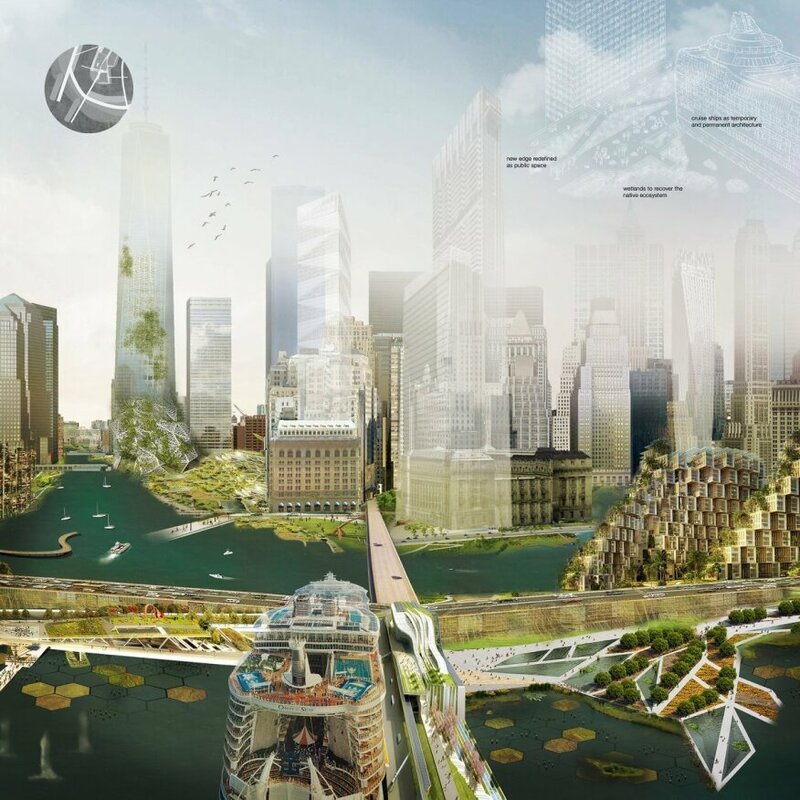 The story is about a design competition to address New York City’s rising seawater. Kayla Devon wrote about it at Builder Online, “In the next 30 years, roughly 30% of Manhattan is expected to sink below sea level, according to a climate study by the NASA Goddard Institute for Space Studies. Instead of trying to stop the inevitable, Brazilian architect Walmir Luz focused on embracing it. “After studying climate predictions from the United States Landfalling Hurricane Probability Project and the history of Manhattan’s edge, Luz designed a utopian/dystopian future for New York (depending if you’re a glass half-full or half-empty kind of person). “Luz’s NYC 2050 concept makes flooding a part of city life by taking inspiration from Venice. Luz designed structures as levels that could allow water to move through lower levels as the sea rises. Streets would become permeable so water can wash over the roads instead of flooding them, and more barriers would surround the city’s edges. “Luz completed the concept as his thesis for his Bachelor of Architecture degree from Cornell University, and won a Silver award in the urban planning and urban design category at the A’Design Award & Competition. He now works as an architect for Gensler.” More at Builder Online. I love it when people who read the blog come upon topics that they know will fit and then send them along. I like being able to share the cool stuff with a wider audience. Thank you, Caroline. Luz won a design award for a concept making the best of rising sea levels in New York City. A while back, I showed a photo of a very skinny building near my workplace. Now I have some professional photos from the Providence Revolving Fund, and I think they convey the uniqueness of this building better than my photograph. I love how Providence works so hard to repurpose old and interesting buildings. This one is only a piece of an old building. Once condemned, it is now lovely and functional. Here’s what the Providence Revolving Fund had to say before the dedication in May. “The partnership of David Stem, Lori Quinn and the Providence Revolving Fund announce the completion of the formerly-condemned George C. Arnold Building (built 1923). The Providence Redevelopment Agency (PRA) also played a pivotal role in the revitalization of this unique building. I’ve noticed that most Providence buildings have names and people use the names, as if the buildings were pets. When you call something by its name, it strengthens your bond to it. I’ve had the teriyaki chicken crêpe at Momo a couple times. Messy but delicious. I’m eager for the Asian market to open.